We’ve been trying out a lot of fun recipes lately–that is, at least when we’ve been home. It’s been a busier than usual summer for sure. So, between all the travel, I’ve been trying to get into the kitchen as much as possible and make some delicious food and of course click, click, click with the camera to capture some drool-worthy images. Which is what I think we’ve accomplished with the photos for this recipe. 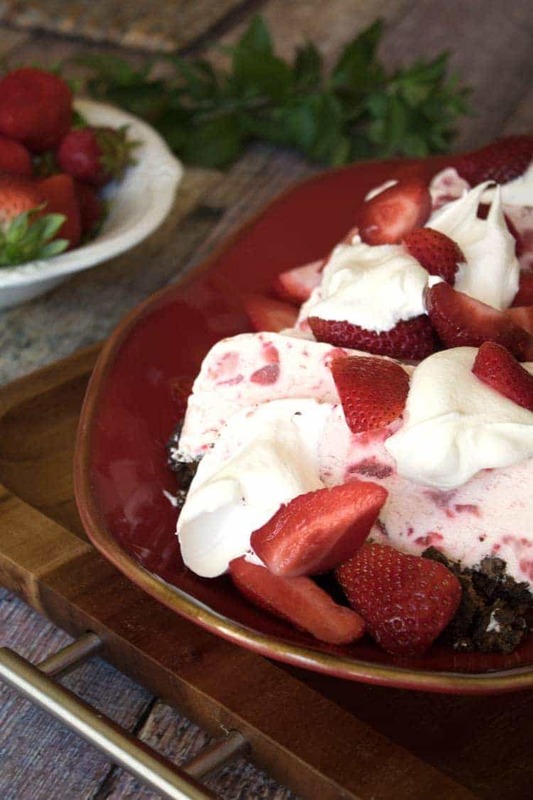 If you like chocolate and strawberries–and especially the two combined–you will absolutely fall in love with this delightful dessert. It is SO easy to make. So easy. As in–why in the world I did not make it sooner I have absolutely NO idea. Because I wish I had. I might be 20 pounds heavier as a result, but if it was all because of this Whipped Strawberry Dessert, I might even be okay with that. Of course–as I write that I’m thinking that it might be a good time to start doing planks or crunches, because I’d really like to enjoy another slice of strawberry chocolate yumminess! The thing about desserts like our Whipped Strawberry Dessert–and desserts like our Fruit ‘Salad’, Banana Cream Dessert and just about every smoothie we make–is that even though they are sweet, they still have some good-for-you ingredients. And really, if we’re enjoying tasty treats in little bits and bites…well, it can’t be all that bad, can it? Line a loaf pan with foil being sure to extend the foil over the edges. Place 2 cups of the strawberries into a large mixing bowl. Pour in the milk and lemon juice. Add 2 cups of the whipped topping and stir until all the ingredients are well blended. Transfer the mixture into the prepared loan pan. Place the cookie crumbs into a mixing bowl. Pour the butter over the crumbs and toss to coat well. Press the mixture over the top of the strawberry mixture. Cover the pan and place in the freezer for at least 6 hours. Remove from the freezer and invert the pan onto a serving platter. Remove the foil and discard. Thinly slice the remaining strawberries. 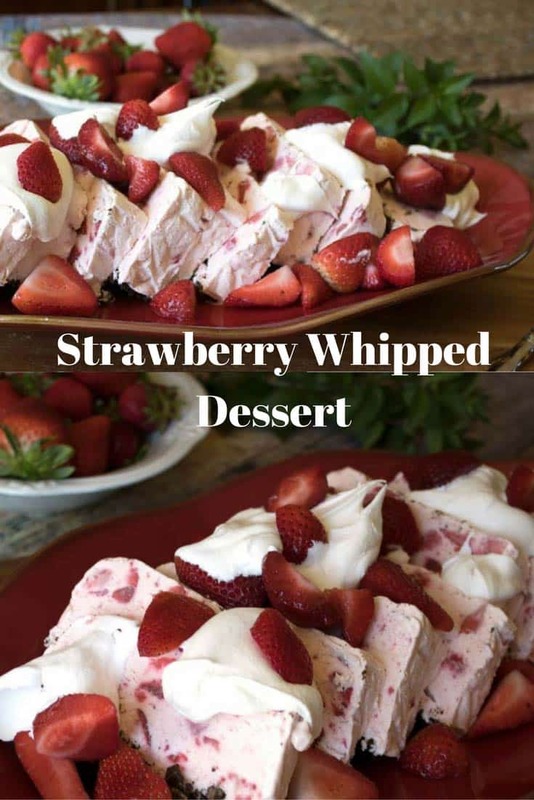 Frost the dessert with the remaining cool whip and top with the sliced strawberries. This dessert is simple to throw together. Fix it the night before and let it freeze overnight. Going to a potluck? 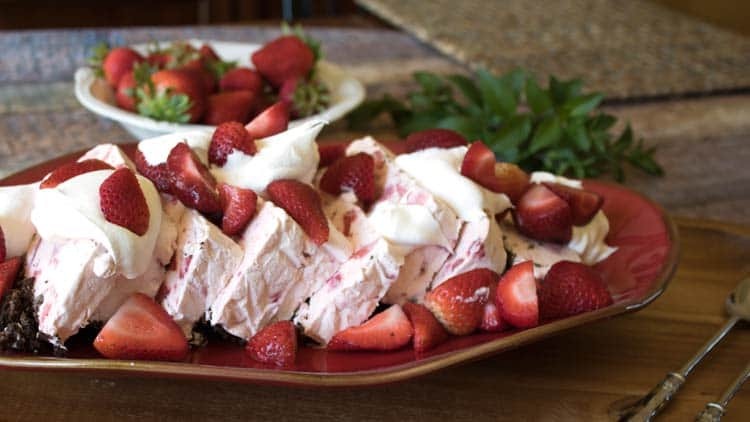 Strawberry Whipped Dessert is a winner that everyone will love! Just make sure you are ready to give out the recipe if you bring this gorgeous dessert, because you will be asked for it again and again. And you use the condensed milk where? You add it to the strawberries after they’ve been mashed, along with the lemon juice. Two thumbs up! I LOVE your recipe. This is perfect with a chocolate syrup on top.